• Underlying infection of the scalp. • Too much or too little oil produced by sebaceous glands. • Sign of an allergic reaction to chemicals in hair gels, sprays, and shampoos, hair oils. Many anti dandruff shampoos are available in the market but before resorting to any of them one should consider taking the help of few home remedies which might work for him. With the use of a mild shampoo clean your scalp twice or thrice a week. Add some lime juice in coconut oil to make it a perfect home remedy for dandruff control. Apply a mixture of margosa oil with camphor in it for dandruff control. Massage your hair and scalp with olive oil or sesame oil at night. Curd is another effective natural remedy to cure dandruff. Apply curd on your scalp and hair and wash it off after 20 minutes. Enough exposure to sunlight is one dandruff home remedy that does not cost anything and is most easily followed. Add 2 tablespoons of vinegar to 6 tablespoons of water, use cotton to dab this solution on your scalp. Boil rosemary leaves in 1 liter of water and add 2 tablespoons vinegar into it. This is a terrific therapy to treat dandruff. Apply the paste of 2 tablespoons fenugreek seeds (soaked overnight) thoroughly on your scalp for a dandruff free scalp. A paste of lemon juice and garlic when applied on scalp for 20 minutes can smoother your dandruff. Hot steam bath can be one of the great home remedies for dandruff control. After shampooing your hair rinse your hair with water having 4 teaspoons of vinegar mixed in it. 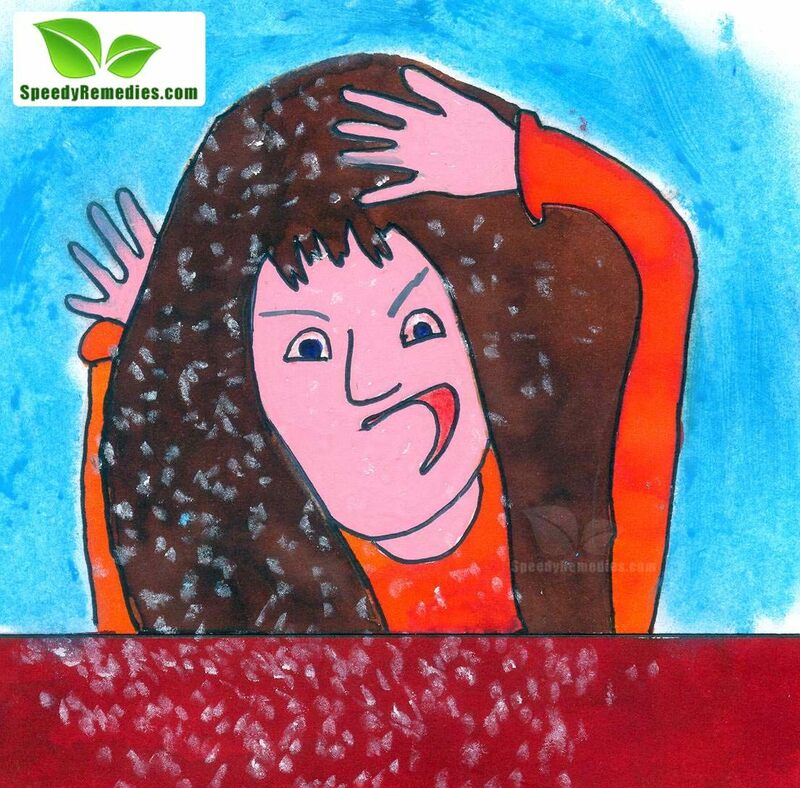 This will not only eradicate your dandruff but will also give luster to your hair. Another good solution for dandruff is the use of tea tree oil; it must be applied to the hair an hour before wash. Regular application of aloe vera gel can heal your dandruff problem in 15 days. In this video Diana Kerala Das explains quick and effective home remedies for dandruff control. Avoid washing hair too often. Keep cleaning your combs and brushes. Avoid scratching you scalp, it can make the situation worse. Do not use strong hair styling products. Avoid keeping your hair wet for long time. Do not use other’s combs. Getting rid of dandruff requires time however, so whatever treatment you use from our home remedies for dandruff control, you will need to continue it for several months.